IT was fiercely hot inside the hut, although the click and snap of the tin roof spoke of its cooling now that the sun was off it. The men eating their supper at the long deal table sat with shirt sleeves rolled up and collars open at the throat, and the sweat drops glistening on their browned faces, brick-red arms, and lean throats. In spite of the heat they ate hugely, as men do who have spent a long day in the saddle, and “Blazes,” the cook, was kept busy replenishing the heaped-up plates. The Love Story of a Man with aBad Name. (Published serially underthe title Unstable as Water). Steeve stooped and slid his hands under her arms, and lifted her till her face was level with his, and kissed her full on the lips. As they finished, one by one the men pushed their plates back and loaded their pipes, and the reek of strong tobacco mingled with the smells of cooked meats and the kerosene lamp on the wall. “Scottie” Mackellar, slow and deliberate in eating as in most things, was the last to finish and light his pipe. He had been down to the station that day, just returning as supper was served, and although the men waited expectantly for news or orders, they waited without questions, knowing Scottie and his ways, and that questions were more likely to delay than hasten his words. “Whip” Thompson tried gently for a rise. “What’s it looking like below, Mac?” he asked. “Dry,” said Scottie, slowly, “vera dry.” As they had all been thinking and talking of little else but the dry spell that had lain hot and heavy on the land for months past, this did not convey much fresh information. “How d’you think the sheep are makin’ out?” tried Whip Thompson again. “Wot’s the boss sayin’ about it?” asked another man. “What would he be saying?” countered Scottie. Scottie made no reply, and the men began to drift slowly out of doors to lounge and smoke, or perch themselves on the rail in front of the hut. “’E’s a bloomin’ hencyclopeedy, ain’t ’e?” said Ever, disgustedly, when he had settled himself comfortably. “You’d have got more if you’d asked less,” said Aleck Gault, with a light laugh. A lumbering man, with a heavy jowl and a thick neck, sprawled his arms on the top rail of the fence and laughed hoarsely. “If you never want to know—just ask him,” grunted Darby. “Wot to do?” said Jack Ever. Steve Knight looked up from the stockwhip he was plaiting. “Stay out or get back at night?” he asked. “Get back,” said Scottie, and moved slowly away. The men watched him go to the old hut that stood a couple of hundred yards from the big one, untwist the bit of fencing wire that held the door, and pass in with his broom. The cook had bounced from the door, dashed out a basin of greasy water, and flung himself inside again with violent anger and indignation in every motion, and then the men could hear him rattling and slamming dishes about as if they were his personal enemies. They were all too well accustomed to the blazes of anger that had earned him his name to pay much attention to it, and just at present they were much more concerned over what Scottie was going to do with the small hut. But it appeared there was a connection between the two things. “Wot’s Scottie doin’ wi’ the old hut?” put in Whip Thompson. “Perhaps the boss is goin’ to move in here while the sheep are up,” suggested Steve Knight. He moved off before the men could reply, and he left them staring in amazement. One or two of the men were laughing, and Blazes stopped and glared at them. “He said niece, didn’t he?” said Aleck Gault. “Well, she can cook for ’im an’ you too, for all o’ me,” snapped Blazes. “I’m done wi’ this job. Sheep here’s bad enough, but a woman—that’s the finish, that is,” and he stumped off. He had threatened to throw up his job too often for the men to believe it, and now their minds were on something more interesting. “D’you s’pose we’ll ’ave to wear jackets when she’s knockin’ about?” said Whip Thompson, glancing at his bare arms. “You’ll have to wash your shirt oftener,” said Aleck Gault, laughing. “Seems to me it’s going to be a blame nuisance,” growled Ned Gunliffe. “They’re some as could give longer ears—an’ that’s asses,” said Ned. “It’ll please you, I suppose, Fly-by-Night. Save you some moonlight trips if you’ve a girl to spark right at home here,” said Ned Gunliffe. “Why not marry her an’ done with it while you’re at it?” said Gunliffe. “You’d only have to ask ’er you know. Was there ever a woman yet could resist Fly-by-Night when he rode up a-courting?” He spoke with a hint of a sneer in his tones, and, remembering an old tale of an episode in which Knight and he and a girl had been concerned, the men guessed at a hidden edge to the words. But if there was, Steve Knight ignored it. “Couldn’t ye choose a middlin’ one?” said Whip Thompson, banteringly. “I knew a gal once——” said Darby the Bull, and paused. “Did you still mean it when you sobered?” said Steve, chuckling. “I did,” said Darby, solemnly. Darby the Bull looked puzzled. “D’you think every man that marries is a fool then?” said Whip Thompson. “You’d think women was man-eaters t’ hear you,” said Jack Ever. “Most of them are,” said Steve. “D’you ever tell your girls all these things you think o’ them?” asked Thompson. “I am,” said Darby, so simply and earnestly that the others roared with laughter, and Steve Knight winced in the darkness, though his laugh rang as loud as any. “Are ye tired, lass?” said Scottie. Ess Lincoln straightened her bent shoulders. “When do we come on to the station?” asked Ess. “We’ve been drivin’ through one of the paddocks of it since half an hour after we left the township,” said Scottie. “But isn’t a paddock where you feed the sheep?” said Ess in surprise. “The sheep can still find some,” said Scottie, “though I’ll admit they’ll no find it much longer. The front paddocks is eaten as bare as a city sidewalk, and when these back paddocks is cleaned....” He broke off and shrugged his shoulders. “What a cruel business,” said Ess. She took out a handkerchief and tried to wipe the thick dust from her face. But the dust defied her efforts. It was crusted thick on everything—on the backs of the horses, on every inch of the buggy, on their knees, shoulders and heads. It rose swirling from the feet of the horses, floated past them and hung in a still cloud that trailed for a mile on the road behind them. Out on the plain, to one side of them little dust-devils rose and twirled in the air and moved in twisting spirals across the flats. The boulders on the hills that rose on the other side of the road glared in the light of the sun, and the heat waves along the surface of each spur quivered and danced exactly, the girl remembered, as she had noticed the air quiver over the surface of the locomotive boiler at the sleepy, sun-smitten terminus. “There’s some o’ the sheep,” said Scottie, pointing with the whip to a string of tiny dots on the horizon. “And there’s all that’s left o’ some more,” as they drove past a dozen skins hung over the fence and the huddled red heaps that lay on the ground beyond. A score of crows were busy rending and tearing at the carcases, and they rose, cawing hoarsely, and flapping heavily away a few yards as the buggy passed. “It’s horrible—horrible,” the girl said, averting her face as the birds flopped back to their feast with harsh croaks of satisfaction. Ess shuddered. “Are there any of these sheep about where—where we’ll be living?” she asked. They drove in silence for another hour along the edge of the hill, and then turned in round the shoulder of one of the spurs and trotted steadily into a narrowing valley. The road crept into the side of the valley, and presently the shuffling thuds of the horses’ hoof-beats in the dust gave way to sharp clicks and rattles as the road climbed gradually up the side of the hill. Beyond the head of the valley the hills rose blue and hazy, and Ess sighed with relief. A high fence came creeping down the hill to join the road, and where it crossed their path Scottie pulled up his horses and jumped down to open the gate. He had lapsed into the broader speech he always used when he was moved to deeper feelings or excitement, and the girl glanced at his set face curiously. “They won’t get drunk and—and swear—and that sort of thing before me, will they?” asked Ess, hesitatingly. The valley curved sharply, and the road followed and ran over a shoulder of the ridge and down on to a little plateau, where the out-station buildings and horse paddocks were set. No men were about the houses, but half-way down the slope, and watching up the valley, they saw one man. They could hear from up the valley the pistol-like cracks of a stockwhip, and the deep lowing of cattle, and the rattle of stones. The sounds increased and swelled suddenly to a roar, as a mob of cattle swung round the corner and came surging down towards the slope, at the top of which Ess and Scottie stood. A man cantered easily behind the mob, the long-thonged stockwhip swinging in his hand, and snapping swiftly at any beast that swerved from the mob. Ess watched the scene spread at her feet, and her eyes shone with pleasure and excitement at the sound of clattering hoofs and rumbling lowings, and the sight of the tossing heads and horns, and shifting colours of the rushing bodies. “How beautifully the man rides; oh——” Ess caught her breath at the whirling speed and suddenness of what followed. Horse and rider shot forward with a rush, swerved from the track, and went clattering and scrambling along the face of the hill past the cattle. The mob was a small one of twenty or thirty, but the track and valley bottom was narrow, and gave no room to pass otherwise. Fifty yards past the head of the mob the rider turned and swooped down to the track again, the loose stones and rocks clattering and roaring at his heels. For an instant Ess thought the horse had fallen, but at the foot he picked up his stride and swept round in a curve. The mob had checked and half turned on itself at sight and sound of the horseman before them, and next moment he was crowding them back, his body swaying lithely in the saddle, and the whip pouring a volley of crackling reports about them. They swung outwards towards the slope where the cook was standing, and the horseman circled round and round them, his whip falling in lightning strokes on any of the brutes that tried to break out. Gradually they steadied and stood, crowding into a compact bunch, heaving restlessly and rattling their horns. Ess let her breath go with a deep sigh. “It’s wonderful,” she said. Below them they heard the rider shout “Which one, Blazes?” and saw the cook cautiously approach and scrutinise the shifting bodies. The rider slowly approached the mob, the brutes flinching and crowding back from him. Suddenly the whip flickered out a few swift cuts, swung back and snapped out a string of reverberating cracks, the horse leaped forward and crowded into the opening the yielding bodies gave him, and horse and rider and cattle grew dim and indistinct in the dust that churned up and hung about them. Out of the haze the cattle broke with terrified bawlings, and scattered galloping over the valley and the slope. The brindle with the white face went tearing down the track, the horse thundering at his heels and forging alongside him. The slashing whip turned him, and they came racing up the lower slope. Straight for the cook they came till to the watchers above it seemed they must run him down. Then they saw the horse quicken his stride, and, as he came alongside with a rush, the rider leaned out and snatched at the waving tail beside him, whipped it in to his leg—and with a crash the bullock came down head over heels. At the same instant the horse propped sharply, and before he had fully stopped the man was down and running to the fallen beast. As he flung himself on it the dust hid them again, but in a few seconds he was up and running back to his horse, leaving the bullock struggling helplessly on its side with tied feet. The horse stood till the man was almost touching it, and then, as it moved forward, with a clutch and a spring he was in the saddle and the horse was off at a gallop, sweeping round the scattered herd. In less than a minute they were swept together, and being pushed up the valley and round the corner. None of the men saw Ess Lincoln that night. She was dead beat, Scottie said, and had turned in after some tea and tucker. Next morning they were all up and away about their work before Ess was up or out, but after supper that evening Scottie brought her over and introduced her to the men. Steve Knight was not there at the time. He had been over to the head station, and the men were either in their bunks or getting ready for them when he came in. But if he did not see her, at least he heard enough of her. “I wasn’t hungry to see her,” said Steve, calmly, “and I was hungry for my supper.” He seated himself and commenced to eat. “D’you think we’ll have to camp up in the mulga paddocks?” said Aleck Gault. “Does the boss know she’s ’ere?” asked Whip Thompson. “The boss was too busy thinking about his sheep to bother, I expect,” said Steve. 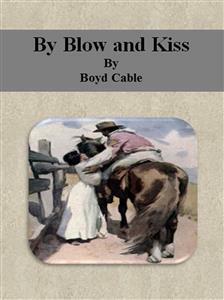 “I’d try the Roman if I was you, Whip,” said Aleck Gault. “She can ride all right—she tole me,” said Darby the Bull. “I might len’ ’er my ’orse,” said Blazes, reflectively. Now Blazes’ horse was the standing joke of the Ridge. The men swore he’d been crossed with a sheep and was born too tired to feed himself. But Blazes thought a lot of his horse, and was most jealous of anyone using it, although he had little riding to do himself. His offer to lend it made the men laugh, but it made Steve open his eyes. “Reckon you’ll go crazy too when you see ’er,” said Jack Ever. Jack Ever was sitting up in bed smoking. He took the pipe from his mouth and fixed his eyes on an empty corner of the room. The other men were carefully avoiding his eyes, but Steve Knight knew as well as if he had been addressed by name that the warning was spoken to him. There were grunts of acquiescence from some of them. He blew out the light and flung himself angrily on his bunk. Next morning, when the men were saddling up in the paddock after breakfast, Ess Lincoln came out to wish them good morning. “All right, cook, but thank you for thinking of lending him all the same,” said Ess. “Where’s the other man—the one I haven’t seen except in the distance—Steve Knight, wasn’t it?” asked Ess as the men mounted, and Scottie placed his foot in the stirrup. The others found Steve waiting for them at the dingo fence of the back paddock. He was sitting smoking, and as the others came near he opened the gate to let them through, closed it behind them, and joined them without any remark. He rode beside Aleck Gault as they jogged along across the dusty flat, and when he pulled up to light his pipe again Gault pulled up and waited for him. “What made you swallow breakfast and clear in such a hurry this morning, Steve?” said Gault as they moved on again. “You’ll like her, Steve,” said Aleck Gault, quietly. “I hope not,” said Steve, shortly. “For her sake and my own. If I liked her I’d want to be seeing her and talking to her, and I’d do it as often as I wanted, in spite of that mammying lot. And they’d be hanging about and consulting with each other as to whether I was ‘playing straight’ or ‘fooling her,’ as they put it. Pah!” he finished with an expression of disgust. “That might be all right for you,” said Gault. Which was something very near what Ess had said to her uncle about him, if you remember. When they did meet, the encounter was not in the least like what Ess Lincoln had expected, and more or less planned with herself. She had made up her mind that Steve Knight had probably been completely spoiled by the women he had met. He was evidently a handsome man by all accounts, and had an all-conquering way with women, and would take it as a matter of course that she should add her share to the usual feminine admiration. No girl likes to think she is held cheaply, and Ess was determined she should not be. Besides which she was a good girl, as the expression has it, and took it to be her duty to be casual and distant to any man with the reputation she had heard this man bore. Consequently, when she was standing talking to her uncle at the door next morning, and he called Steve Knight over to them, saying “I’ll just introduce ye to Steve, Ess,” she waited the meeting with a quietly reserved air, and an odd unaccountable little flutter of her pulse. But, to her surprise, he made no endeavour to impress her, or be particularly nice. In fact, on going over the interview to herself afterwards, she had to admit that he had been very much the reverse. He had merely taken her hand in a perfunctory grasp, quietly said “Pleased to meet you, Miss Lincoln, nice morning,” and then turning to Scottie had remarked that the men were ready and would they be going on. “Just gie them five minutes,” said Scottie, and Steve raising his hat said he would tell them so, asked Ess to excuse him, and walked briskly off. He left Ess utterly bewildered. “Well, if that’s your ladies’ man, he strikes me as having a most unceremonious manner,” she said to Scottie, struggling between an inclination to laugh and be angry. Scottie was a little surprised himself, but he merely grunted and made no remark. Each night and morning for the rest of the week Ess was in the yard to wish the men good evening or good-bye as they came or went, and usually spent a few minutes chatting to one or the other of them. But she never chatted to Steve Knight, and it was impossible for her to help noticing that he did nothing more than raise his hat and murmur a conventional word, and then ignore her. No girl likes to be ignored by a man, even a wicked man, and especially if he is good-looking as well as wicked. So Ess was annoyed, although she would have denied it indignantly if it had been suggested to her. She saw very little of the men that week, as they were away from dawn to dusk, and coming in dead tired, did little more than eat their supper and go to bed. Ess was looking forward to the Sunday, when Scottie and all the men would be resting at the Ridge, but it was with a sense of the most unmistakable disappointment that she heard that Steve Knight had gone off the night before to ride in to the township to spend the Sunday. “What does he do there?” asked Ess. “Oh, just drinkin’ maybe, or it micht be on some ploy wi’ a lassie.” Ess asked no more. She looked curiously at Steve, though, on the Monday morning when she went out to see the men saddling up. He certainly seemed quite as fresh as anyone there, and greeted her with a cheerful nod. “Getting hot again, Miss Lincoln,” he said. “The night is the best time for riding just now. It was beautifully cool on the hills last night.” He turned and moved away without giving her a chance to reply. The opportunity came that same night. When they came to the back paddock fence on the way home, they found Ess waiting for them on Diamond. Whip had had little difficulty in getting the horse used to the skirt, and after a few days he took no more notice of it than if he’d been used to it all his life, so Whip was ready to hand him over and see Ess mounted on the Sunday. They rode quietly towards the Ridge, and Steve pushed his horse alongside her. “I must compliment you on your seat on a horse, Miss Lincoln,” he said.